All right, I know most of you will think "Big Deal! 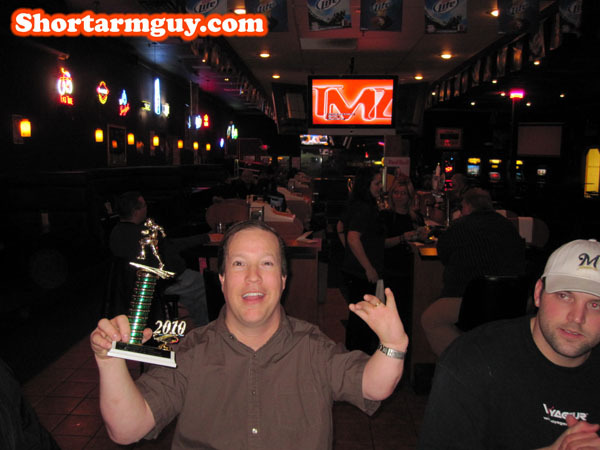 He won his Fantasy Football League. Who Cares?" Well, the people at my office care. We have a 12 man league and we take our Fantasy Football pretty seriously! And for the first time, I'm taking home the trophy! I have to give a good chunk of the credit to ESPN's Matthew Berry who told me to draft Arian Foster, Running Back of the Houston Texans, who ended up being the highest scoring player of the year. 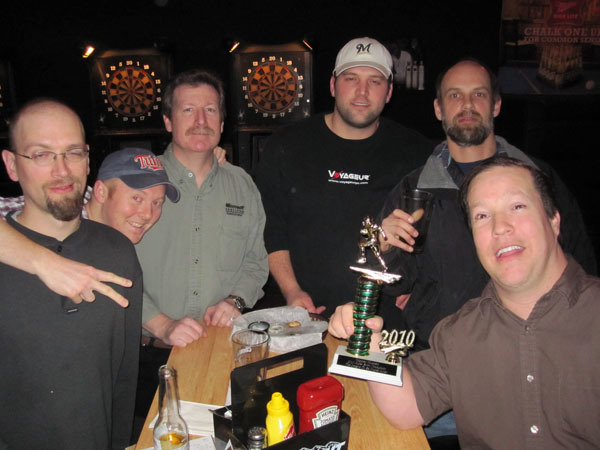 In any case, I'm proud to have won our Fantasy Football League!! Also, I had a pretty lame week and couldn't think of any other pictures to put at the top of this week's diary entry. So this one looked as good as any of them. So when I say I had a pretty lame week, it in no way reflects the fact that Miss Sheri's family was in town. We actually had a lot of fun together! Except in this picture. I was working while they went to the Mall of America together on Friday, so I didn't get a chance to join them in the excitement. Avery was excited for his cousins to come to town, because he got to go with them to the Mall of America's Nickelodeon Universe! 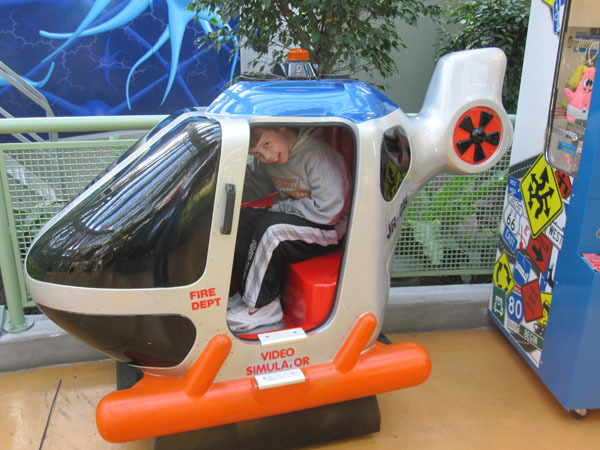 Avery rarely gets to go on amusement park rides because his brother's cardiologist has banned Luke from pretty much all thrill rides due to his heart condition. Therefore, it causes us a lot of drama when Avery gets to go on rides and Luke can't, so we pretty much just try to avoid amusement parks. It used to be a lot easier when we could take Luke on the kiddie rides and sneak Avery away to some of the bigger rides. Unfortunately for us, that strategy doesn't really work any more. 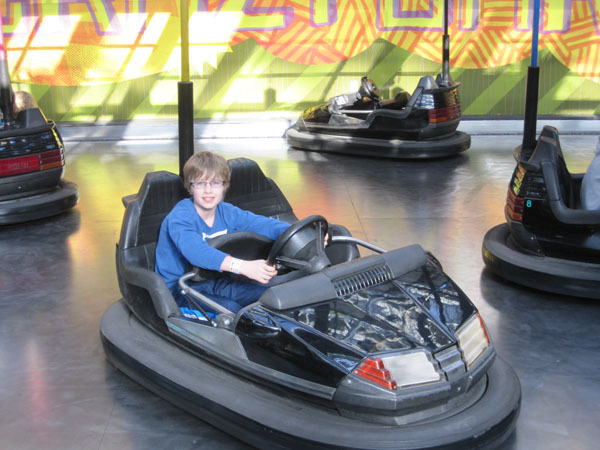 Lucky for Luke, he can still go on the Bumper Cars which gives him a chance to take out some of his aggression on Avery. He has a lot of it pent up which creates for some pretty big collisions. 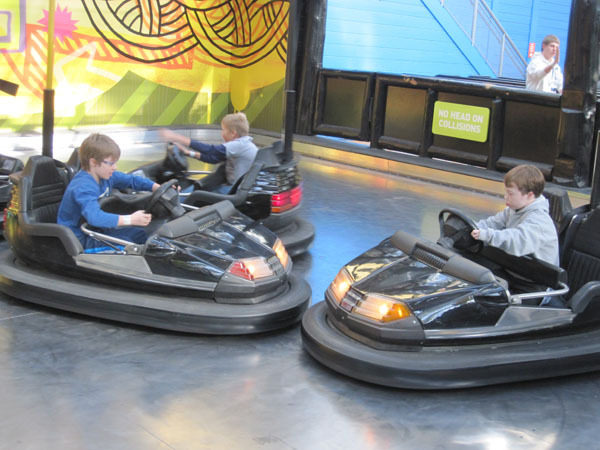 Note the "No Head-On Collisions" sign in back and their lack of attention to it! 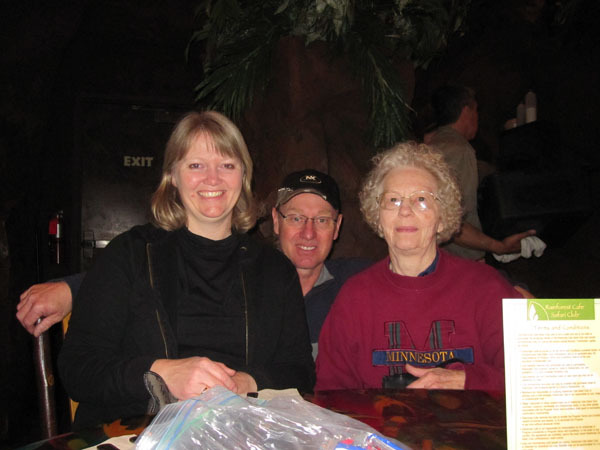 The main reason for Miss Sheri's family to visit us was because we haven't had the chance to have Christmas together yet. 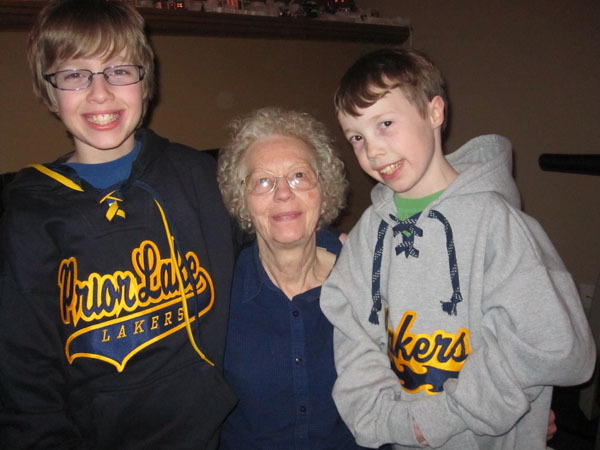 The boys were very excited to open their new Prior Lake Lakers sweatshirts from Grandma!! 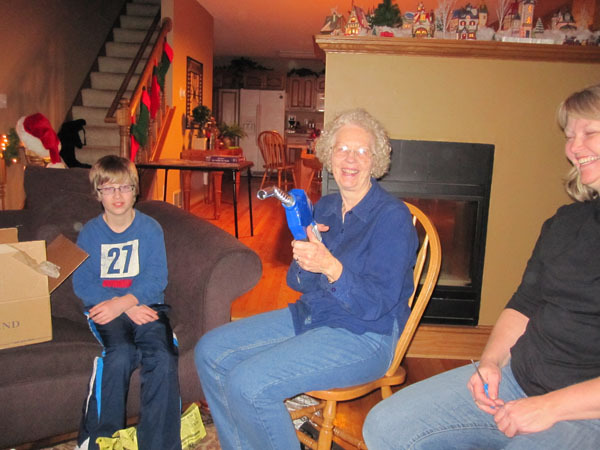 Grandma Leona was just as excited when she opened this brand new gas handle from Uncle Jerry. I didn't catch the reason why she needed one of these, but my guess is she's ripped off 1 or 2 while filling up her car and this is a spare she can use in the future. 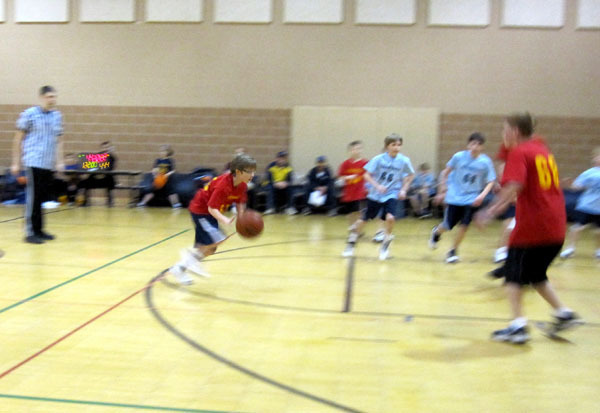 On Saturday morning, Miss Sheri's family joined us in rooting on Avery during his basketball game. We were happy when Avery's team won the game 22 to 20. 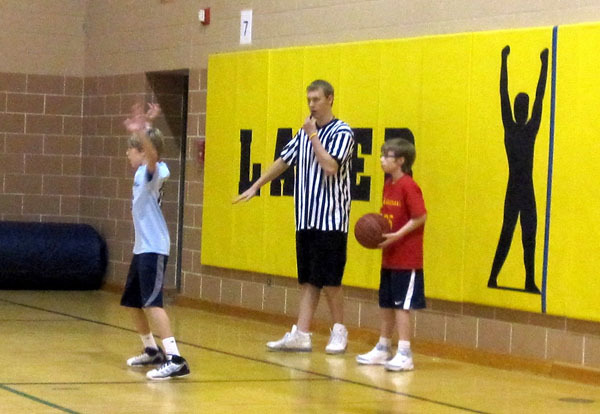 They might have had the upper hand because the other team was trying extra hard to challenge themselves by only playing with their backs turned against their opponents. We're not sure why they did this, but were glad for the win just the same.